TORONTO – Digital and 3D filmmaking will win more fans if the movies are anywhere as good as Alfonso Cuaron’s spectacularly fine “Gravity”. Co-written and co-edited by the director, “Gravity” mixes propulsive drama and high tension with moments of balletic grace within the immense sweep of endless space. At 90 minutes, the time flies by and many viewers will not wait long to see it again. Sandra Bullock gives a strong and nuanced performance as a doctor and inexperienced astronaut whose carefully nurtured first venture into far space explodes suddenly into a world of danger. All the gleaming and superbly efficient pieces of machinery on which she relies are abruptly torn and mangled when large chunks of debris from a broken Russian satellite swarm into her path. The actress must work often in silence and close-up in a spacesuit and helmet as the claustrophobic terror of diminished oxygen belies the peace and beauty of her expansive surroundings. George Clooney is the only other actor on screen in a warm and polished performance as a veteran astronaut whose expertise, experience and calmness are the doctor’s best bet for survival. The work of cinematographer Emmanuel Lubezki, production designer Andy Nicholson, costume designer: Jany Temime, visual effects supervisor Tim Webber and their teams is all first-rate. Composer Steven Price’s score cleverly uses electronics to imply sound where there is none. Cuaron demonstrated with “Children of Men” that he is a master of action-filled long takes and he demonstrates that skill again especially in an opening sequence of startling clarity and extraordinary beauty. He shows what 3D can do when it is used discreetly. Opens: UK: Nov. 8 / (Warner Bros.) / US: Oct. 4 (Warner Bros.); Cast: Sandra Bullock, George Clooney; Director: Alfonso Cuaron; Screenwriters: Alfonso Cuaron, Jonas Cuaron; Director of photography: Emmanuel Lubezki; Production designer: Andy Nicholson; Music: Steven Price; Editors: Alfonso Cuaron, Mark Sanger; Costume designer: Jany Temime; Visual effects supervisor: Tim Webber; Producers: Alfonso Cuaron, David Heyman; Executive producers: Nikki Penny, Chris DeFaria, Stephen Jones; Production: Esperanto Filmoj, Heyday Films; Rating: UK 12A; US PG-13; 90 minutes. 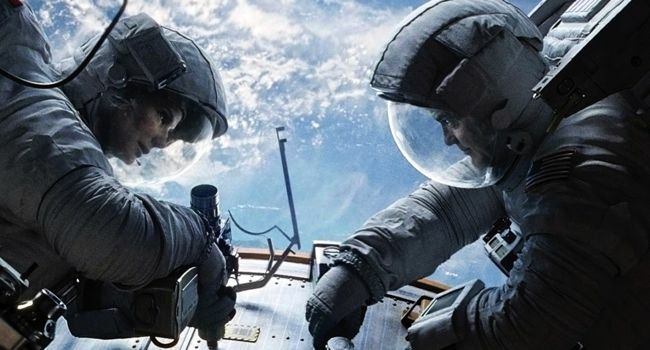 This entry was posted in Film, Reviews, TIFF Toronto International Film Festival and tagged 'Gravity', Alfonso Cuaron, George Clooney, Sandra Bullock, Toronto International Film Festival. Bookmark the permalink.